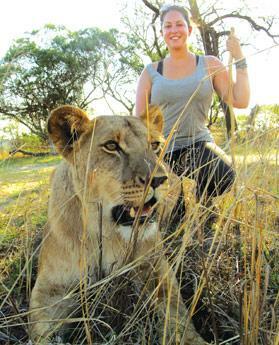 The author gets up close and personal with a lioness. Six kilometres outside of Gweru, a bustling town in the centre of Zimbabwe, a modest sign welcoming you to Antelope Park points down a dirt track. At the end of this impossibly long and painfully bumpy track stands the gate to one of southern Africa’s “most intriguing destinations”. Antelope Park is a safari camp, which, despite its rather placid name, is actually home to the world-renowned African Lion Rehabilitation and Release into the Wild Programme. Set in over 3,000 acres of savannah grassland, it is famous for its activities, which allow visitors a unique view of the king of beasts. A variety of accommodation is available, from luxurious riverside lodges to basic rooms. There’s even a campsite with all amenities for the scrubby backpackers among us. Despite the availability of cheaper accommodation, this is not a travel destination to come to if you are counting the pennies. Being quite cut off from the main town means you will have to rely on the food on offer at the park, and getting up close and personal with lions doesn’t come cheap. Upon arriving at Antelope Park, you will be given the opportunity to learn about the African Lion and Environmental Research Trust (Alert) breeding and rehabilitation programme and all the whys, hows, whens and what ifs associated with it. Just 40 years ago, Africa was home to around 200,000 lions. A report in 2012 estimated the current figure to be 32,000. That’s a decline of over 80 per cent. Stating that lions could be extinct in the next 40 years is no idle threat. Past efforts to release lions back to the wild had only limited success. The Alert programme seeks to remedy this through four stages, the first two of which are ongoing at Antelope Park. In the first stage of the programme, cubs are separated from their mother at three weeks to bond with a human handler so that they may be guided through pre-release training. Part of this training starts at six weeks when they are taken out on their first walk in the bush. These walks allow the lions the freedom to observe potential prey and practise their hunting skills. Until the lions are 18 months old, visitors to the park are allowed to walk with them. No fences, no leashes… just you, two lions and their handlers, and a stick. It’s still unclear to me what good the stick would have been had the lions decided to stalk me. Walking with lions was a surreal experience. I grew up watching these massive cats on Discovery Channel, calculatingly hunting down prey and tearing it apart, and now I was walking alongside them, close enough to touch them and thereby close enough to become dinner. It is a once-in-a-lifetime experience. Participating in this activity also helps generate awareness and raise funds for the programme. At 18 months, the cats start to take part in another activity which visitors can observe: a night encounter. Groups of up to four lions are taken out after three to seven days of fasting and let loose in a vast, fenced area, where they can practise hunting. A red filtered spotlight is used to monitor the lions without affecting either them or their prey. Sitting in an open Jeep while four hungry lions are on the prowl is a questionable place to be but, again, an incomparable opportunity. Aside from the adrenalin of following and watching lions on a hunt, you will have a breathtaking view of the African night sky. Once the lions move on to stage two, they are released as a pride into a semi-wild environment. The aim is to allow captive lions to fend for themselves in a natural situation and become a self-sustaining pride. Human interaction is minimal at this stage but Antelope Park does allow visitors to join research teams in their observation. Stage three of the programme will only be realised once enough funding is obtained. The aim is for the pride to be moved to a larger area in which competitive species, such as hyena, will be introduced. Lion cubs born in stage three will be raised free of human contact. Finally, stage four will see the release of these lions back into the wild. From watching cubs and adults feed to taking an insightful tour of the breeding programme, Antelope Park offers many opportunities to interact with or observe lions in a way you are unlikely to do anywhere else in the world. Other activities include meeting their four resident elephants, taken in as orphans years ago. You can also opt in for an elephant-back safari of the huge grounds. Horse-riding lessons and safaris are another options, as well as kayaking and fishing on the river. Antelope Park is a unique location for those who want a slice of the African wild, while still keeping their creature comforts and at the same time contributing to a worthy cause. Falling asleep to the formidable sound of a pride of lions roaring in the distance and then waking up to the sight of fish eagles diving towards the river are just part of an experience you will never forget.